Sebastien GOUGEON is Doctor in Biochemistry and has worked for cosmetic companies since more than 10 years. 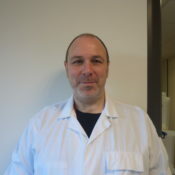 He has joined Miyoshi Europe 5 years ago where he is managing the Laboratory of Development. With his team, he’s aiming at increasing Miyoshi ingredients understanding and performances, developing innovative products and assisting customers through technical advices.